Life for an African Painted Wolf is a bitter struggle on the indifferent savanna of southern Africa. Aalwyn is the leader and matriarch of her pack. With a new litter of pups, she must fight for survival against threats from predators, starvation, and the ever present danger of human poachers. Every day is a desperate hunt, a defense against claw and fang, and an opportunity to teach her young how to endure in a world with no room for the wild. All proceeds from the book directly benefit the painted wolves. 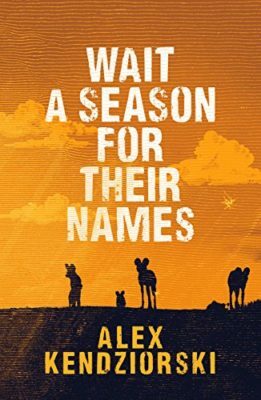 A marvelous tale that I couldn’t put down-Wait A Season For Their Names brought me to a wild and sometimes verdant and lush sometimes desolate and cruel Africa and lead me through the Painted Wolves’ plight and journey with dexterous and passionate rendering. I love that all proceeds from this book will support these amazing and misunderstood creatures. Dr. Kendziorski sheds light on a lesser known animal that shares the plight of many endangered species. The African painted wolves are social animals which this book details with well written prose. Dr. Kendziorski shows he cares about these animals not just by way of writing but also the proceeds from the book directly benefit the painted wolves. Kudos and I recommend. This is a really cool book written from the perspective of painted wolves. It is very easy to relate to these creatures, their families, and what they go through with how well it is written. Proceeds go to a great cause too. © 2018 Alex Kendziorski | All Rights Reserved.